So the holy month of Ramadan is upon us again. In uae, we know that ramadan is welcomed with great enthusiasm. Though ramadan is a time for spiritual growth and charity, ifthar dishes also plays a great role during this holy month. In addition to spiritual benefits, fasting is a great choice to accrue some physical benefits as well. It is very important to drink more water and fruit juices in order to solve all those problems related to fasting from sunrise to sunset. You should follow a balanced diet with right proportion of carbohydrates, proteins and fats. If you are not careful about ifthar meals, you will surely gain weight instead of weight loss. Your ramadan meals or ramadan dishes must include more fruits and vegetables. Some fatty foods like cakes, chocolates, sweets must be avoided completely. Drinking enough water helps in re hydration and reduce the chance of over indulgence. As it is very important to drink plenty of water, fruit juices are the right choice. So lets drink some healthy fruit juices for this ramadan. 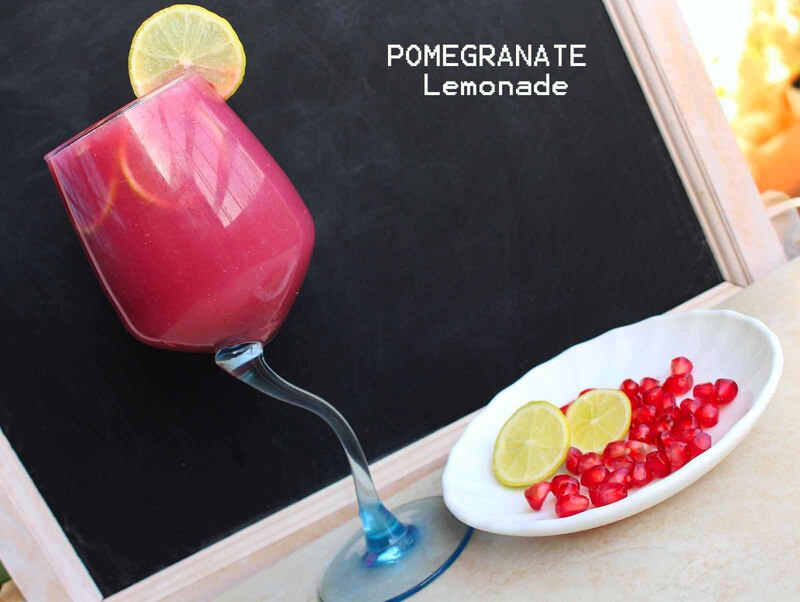 Here is the recipe for a healthy pomegranate lemonade recipe. Do you know that pomegranate is a super food for good skin, hair and health ? Just ride through pomegranate nutrition. 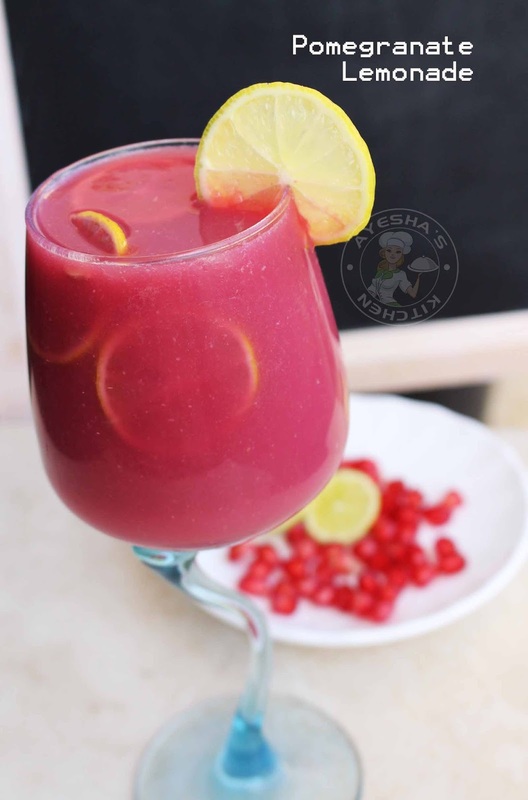 The juice of pomegranate seeds helps to maintain blood sugar level, maintains blood pressure, reduces the risk of cancer, boosts immunity, helps in digestion, improve skin texture, prevents hair fall etc. So lets drink this amazing fruit juice as an ifthar drink. Here is the recipe showing how to make pomegranate lemonade /pomegranate juice recipe / pomegranate seeds /easy punch recipes /lemonade punch / pomegranate recipes /fresh lemonade / lemonade /simple lemonade recipe /easy party punch. First prepare pomegranate juice with seeds of two big pomegranate fruit. For that cut the crown (flower shaped part on top) and remove it. From top, make shallow cuts up to bottom. Cut into halves, drop it in a bowl of water and then remove the seeds from it . Now add this seeds in a blender along with 1 cup of water. Just pulse it for few times in the blender (do not blend as the juice will turns bitter). Pour this juice through a strainer, discard the seeds and pulp. Using back of a spoon, press the pulp maximum to extract more juice. Set aside this juice. Make pomegranate syrup or puree - Boil seeds of one pomegranate fruit and sugar for 5 to 8 minutes until it becomes thick. When done, let it cool and then it blend well. Strain this thick puree through a strainer and set aside this syrup or pulp. (You can make this ahead of time ). 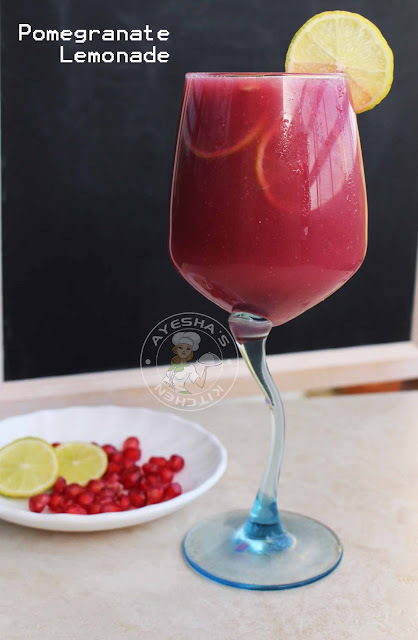 Now lets make pomegranate lemonade - Add lemon juice in a jar, then add pomegranate puree, some lemon slices and then add the pomegranate juice. Add ice cubes. Mix well and pour to glasses . Serve cool.